Pollen allergies afflict over 26 million Americans but predictions of airborne pollen concentrations and exposures are made at the regional scale instead of for individuals. This is partly because pollen concentrations are widely assumed to be homogenous across municipal spatial scales. In cases where pollen concentrations do vary within cities, finer grain estimates could help people avoid pollen and better manage their medications while also quantifying how local plant management can reduce pollen exposures. Creating more sophisticated predictions will require information first on how pollen concentrations vary within cities and second on plant distributions, pollen production, pollen release, and atmospheric dispersion dynamics. 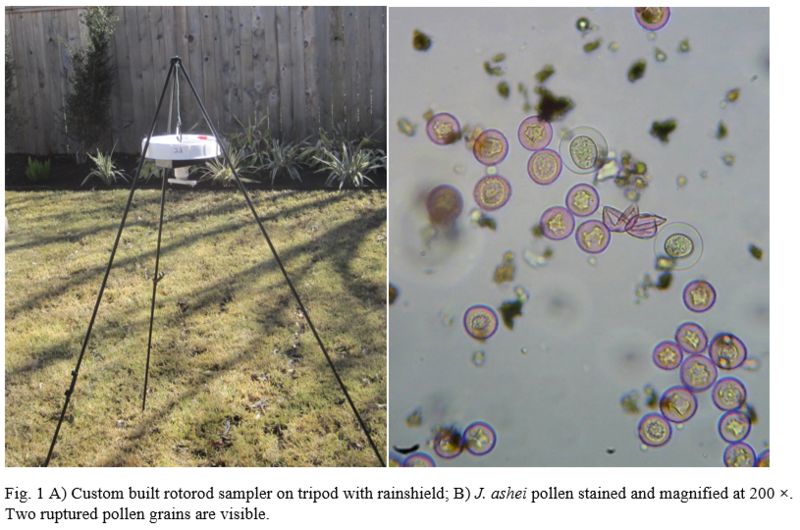 The pilot data demonstrates that juniper pollen concentrations can vary substantially within Austin, and airborne pollen concentrations appeared to match broader patterns of plant abundance. However, this pilot data only includes 24 hours of sampling and does not answer how or whether these spatial patterns vary over time. Additional sampling would be required before these spatial patterns could be used to inform exposure estimates.